Hello Teachers Pay Teachers Family! Thank you for downloading this product. 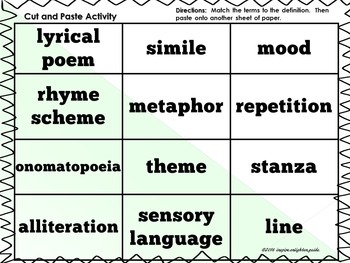 It is designed to be a hands-on reinforcement POETRY vocabulary terms for the 4th and 5th grade STAAR test. 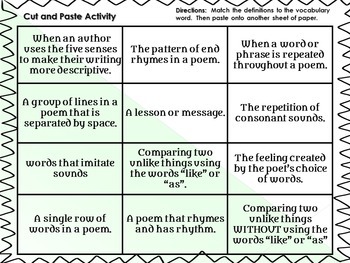 However, it can be used during ANY poetry unit. 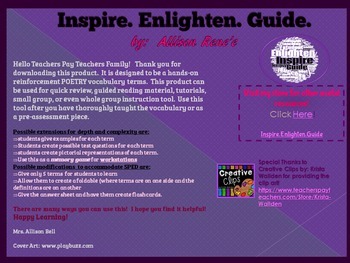 This product can be used for quick review, guided reading material, tutorials, small group, or even whole group instruction tool. 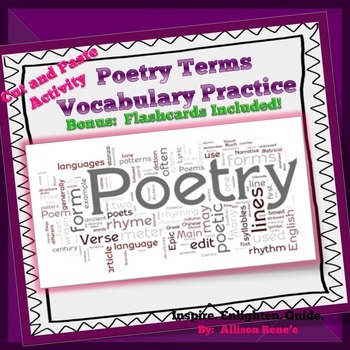 Use this tool after you have thoroughly taught the vocabulary or as a pre-assessment piece. students create pictorial representations of each term. Give the answer sheet and have them create flashcards. There are many ways you can use this! I hope you find it helpful!